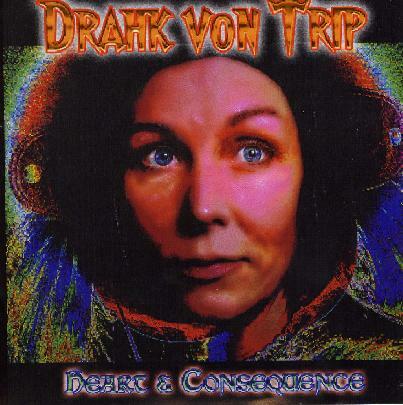 Drahk von Trip - "Heart and Consequences"
It is only every so often that you hear a totally unknown band that has existed for a very long time but plays very cool music. Drahk von Trip it seems (at least some of the players) have been playing together since the 70's I was told. The music is a sort of magical blend of late 60's psychedelia like Jefferson Airplane and HP Lovecraft (with the blues aspect removed and a more ethnic-folk sound used). Some of the tracks remind me a bit of traditional Swedish bands like Garmarna but playing psychedelic rock. The band use old analog synthesizers, didgeridoo as well as some heavy guitars and great female vocals, which tell cool stories. The bass playing is very cool and very interesting at times. The material on this CD was recorded live in the studio and a few overdubs were made. It has a great organic sound and great songs. One of the best CDs of 2005.